Multi-vane (or louvre) dampers, usually used to describe dampers with more than two vanes, offer very good flow control characteristics, especially when an even number of vanes are used, so that symmetrical air flow is maintained. Dampers with multiple vanes are beneficial where limited internal space is available upstream or downstream of the damper. This may be due to bends on the duct, grilles or other process-related equipment in close proximity to the damper. Multi-vane dampers are also used where the height of the damper (perpendicular to the spindle axis) is greater than the width (parallel to the spindle axis). Extremely large dampers may have multiple-vanes in both axes, but these require central bearings so process conditions need to be compatible with this. In the same way that twin-vane dampers are linked, the spindles of a multi-vane damper are externally connected by a multi-stage adjustable linkage, incorporating maintenance-free rod ends. Multi-vane dampers are best suited for flow-control rather than for shut-off as the combined vane periphery to cross-sectional area ratio is relatively high compared to that of a single-vane damper. Many multi-vane dampers are therefore designed with a nominal gas between adjacent vanes and between the vanes’ edges and the inside of the damper body as a good seal in the closed position is not the prime requirement. 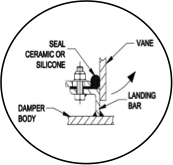 In certain circumstances, though, the combination of good flow control and as good as seal as possible is required in the closed position. In this case cross-stay splitters can be fitted between the vanes, onto which a variety of seal options can be mounted. 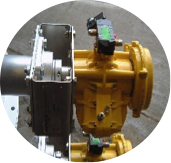 As with a twin-vane damper regulating actuation (either pneumatic or electric) can be achieved with the addition of a positioner.